Most of the world cooks with wood or LPG and this can now be replaced with Cenergy Solutions’ adsorbent natural gas tanks that can be filled with pipeline gas or biogas that comes from farms, landfills or wastewater treatment plants. Over a trillion cubic meters of biogas is wasted yearly around the world and this gas can now be captured and used for cooking, heating or running engines. Instead of wasting renewable biogas it needs to be used to replace fossil fuels and wood burning that hurts our enviornment. Adsorbent Natural Gas (ANG) technology has been advanced with Cenergy Solutions’ new US patent that overcomes the hurdles that has blocked the widespead use of adsorbent natural gas storage in the past. 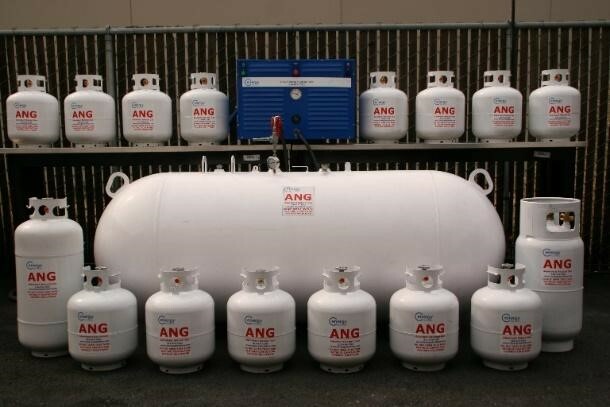 ANG is an economical and logistically easy way to store natural and biogas at low pressures making it unnecessary to store gas at high pressures. 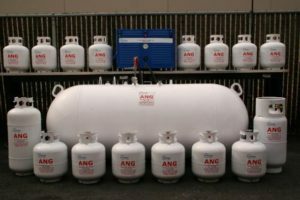 ANG stores natural and biogas at pressures from 250 to 900 psi eliminating the need for expensive compressors, cylinders, valves and equipment. The future of storing, transporting and utilizing natural and biogas gas will be done at lower pressures using adsorbent natural gas technology. 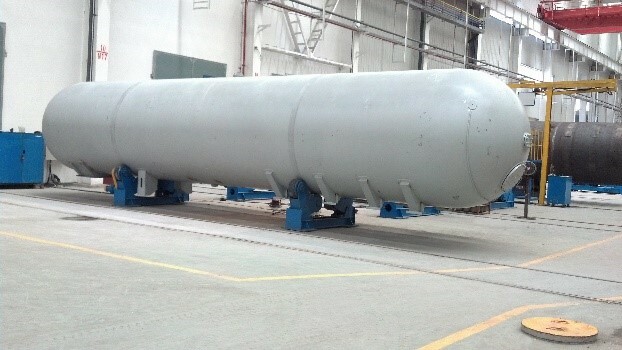 The transporting and storage of natural and biogas can also be accommodated in jumbo ANG tanks. These tanks can be used to replace high pressure tube trailers or LNG tanks or be used to be the last mile distribution of natural and biogas once it reaches its port or destination. 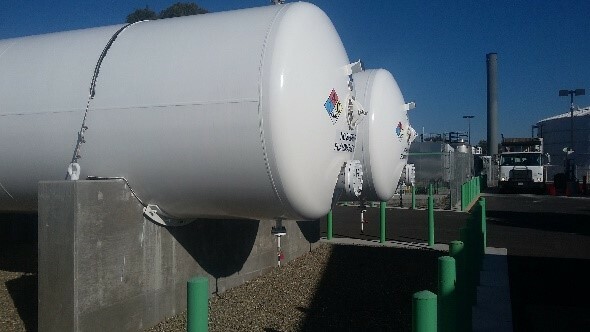 Jumbo ANG stationary tanks can be used for natural or biogas storage at fueling stations, farms, landfills, factories, power or waste water treatment plants. Cenergy Solutions has brought cutting-edge natural and biogas ANG systems to market for vehicles, virtual pipelines, heating, electrical generation, cooking and other applications throughout the world to reduce pollution and promote energy independence. Cenergy Solutions’ new V.P. of Business Development, Lance Fanger has proven experience in bringing young companies to maturity. Cenergy Solutions rapid growth will benefit from Mr. Fanger’s experience. 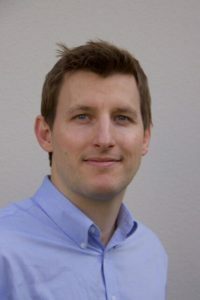 July 10, 2018 – Cenergy Solutions, a US-based corporation, announced today that Lance Fanger has joined their team as their V.P. of Business Development. Mr. Fanger was one of the founders and CEO of Healthsource Global Staffing, a US-based company that staffed medical facilities nationwide. Over a 10-year span Mr. Fanger built Healthsource Global Staffing into multimillion dollar company that was a leader in their specialty staffing market. After Healthsource Global Staffing was acquired by a public company 2 ½ years ago he stayed on as the General Manager until he resigned on July 1, 2018. Mr Fanger said, “When I saw the immense growth potential at Cenergy Solutions I decided to leave my lucrative position and join Cenergy’s team. I am excited to help build a company that has so much potential to help millions of people around the world convert to a clean renewable energy source.” Mr. Fanger graduated from Utah State and is multi lingual with international experience that will help him work with foreign companies throughout the world to utilize Cenergy’s proprietary Adsorbent Natural Gas (ANG) technology. Cenergy Solutions is working with companies from four continents that want to distribute Cenergy’s adsorbed natural and biogas systems to replace LPG, gasoline, diesel and biomass burning. These partnerships will be overseen by Lance Fanger as Cenergy Solutions seeks to install ANG systems and technology worldwide. At this time Cenergy has projects in Kenya, Thailand, India, Puerto Rico and California with projects that are being considered in China, Nigeria, Brazil, Peru, Colombia and the US. Interested companies should contact Lance Fanger at lance.fanger@cenergysolutions.com for more information. Cenergy Solutions’ adsorbent natural and biogas technology allows you to store methane molecules in a dense state at low pressures. You can store 3-10 times the amount of natural gas or biogas in an ANG tank as you can in a conventional compressed natural gas tank at the same pressure. Natural and Biogas is vented or flared around the world because it cannot be economically stored or transported. Cenergy’s new patented low-pressure ANG systems now solve this problem by capturing and accommodating the use of natural and biogas for home and commercial use. If you are interested in distributing or utilizing these systems in your business, community, or country, please contact us to learn more about our ANG systems and equipment. Cenergy Solutions installed its patented ANG Distribution and Utilization System at a landfill in Puerto Rico that has been flaring enough biogas to supply 70,000 families with gas to do their cooking. June 18, 2018 – Cenergy Solutions, a US-based corporation, announced today that it completed the installation of their ANG Biogas Capture and Utilization System in Puerto Rico at a landfill that has been flaring biogas for over 10 years. Last week landfill biogas was compressed with Cenergy’s ANG low-pressure system and stored in ANG tanks that hold enough biogas for a family to cook with for up to 16 days. The ANG cylinder also supplied the landfill biogas to operate a small generator that could be used to replace interrupted power in homes and businesses. The operators of the landfill have over 380 trash trucks that could be converted to duel fuel biogas systems that would use Cenergy’s ANG technology to significantly reduce their use of diesel. 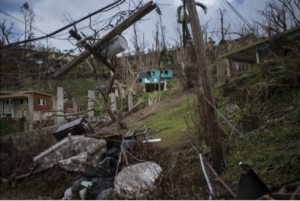 The biogas that is now being flared at several Puerto Rican landfills, along with the potential production and capture of biogas at wastewater treatment plants, landfills, and farms using Cenergy’s Biogas Capture and Utilization System, would significantly reduce Puerto Rico’s dependence on its existing electrical grid, diesel, gasoline and propane. Cenergy Solutions’ BCU System is easy to install, easy to use and can fill large numbers of portable tanks with biogas on a continuous basis. Biogas is vented or flared around the world because it cannot be economically stored or transported. Cenergy’s new patented low-pressure ANG systems now solve this problem by capturing and accommodating the use of biogas for home and commercial use. Cenergy’s dependable low-pressure UL certified compressor and ANG tanks will give the operator and the customers an economical way of utilizing biogas for a large variety of applications for years into the future. If you are interested in distributing or utilizing these systems in your business, community, or country, please contact us to learn more about our ANG systems and equipment. Cenergy Solutions has brought cutting-edge natural and biogas ANG systems to market for vehicles and other applications throughout the world to reduce pollution and promote energy independence. Cenergy Solutions, a leader in low pressure adsorbent natural gas (ANG) technology has a Biogas (biomethane) Capture and Utilization System to help farms and communities around the world economically store and use their biogas instead of venting or flaring it. It is estimated that trillions of cubic meters of biogas are vented or burned worldwide each year from landfills, wastewater treatment plants and farms. This does not include the biogas that is not captured with a biogas digester and escapes into the atmosphere. Methane, the main makeup of biogas is reported to be 25 times more harmful to the atmosphere then CO2. Biogas, a renewable energy source is wasted around the world when it could be used to cook, heat water, run generators, farm and vehicles including scooters, passenger and commercial vehicles. The World Health Organization estimates that there are over 4.2 million people that die each year from pulmonary disease caused by cooking with wood. Cenergy Solutions’ adsorbent biogas systems can capture, store, transport and utilize this wasted renewable energy so that individuals and communities around the world can become energy independent by utilizing the renewable energy created from their organic waste. 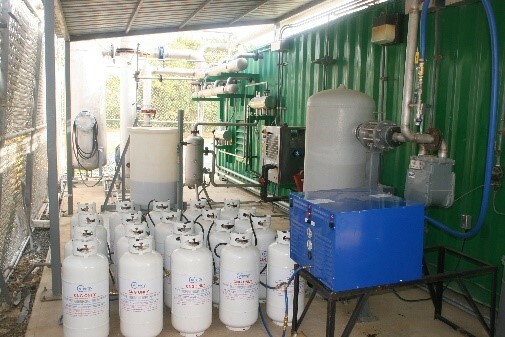 Cenergy Solutions’ proprietary Biogas Capture and Utilization System (BCU System) can now economically compress and store biogas in low pressure ANG tanks to be efficiently distributed to rural areas that are now cooking with LPG, wood or other biomass that is harmful to individuals and our environment. ANG tanks that are similar in size and weight to LPG tanks can be filled with biogas to be used in place of LPG in almost any propane appliance or application. Cenergy’s BCU System is dependable, easy to set up and can save money and even generate income while helping the environment and communities with their energy needs. Gary Fanger, Cenergy’s CEO said, “There is no reason for communities to be dependent on outside energy sources when they have the ability to generate biogas to replace fossil and biomass fuels in large quantities. If the world utilized this renewable energy it would save money, save our environment and most importantly save lives”. Cenergy Solutions’ BCU System is easy to install, easy to use and can fill large numbers of portable tanks with biogas on a continuous basis. Biogas is vented or flared around the world because it cannot be economically stored or transported. Cenergys’ new patented low-pressure ANG systems now solve this problem by capturing and accommodating the use of biogas for home and commercial use. Cenergy’s dependable low-pressure UL certified compressor and ANG tanks will give the operator and the customers an economical way of utilizing biogas for a large variety of applications for years into the future. If you are interested in distributing or utilizing these systems in your business, community, or country, please contact us to learn more about our ANG systems and equipment. Cenergy Solutions has brought cutting-edge natural and biogas ANG systems to market for vehicles and other applications throughout the world. May 2, 2018 – Cenergy Solutions, Inc. announced today that it has received notice from the US Patent Office that their ANG system has been allowed for a US patent. Additionally, the WIPO – World Intellectual Property Organizations’ International Searching Authority has given an opinion that Cenergy Solutions’ ANG. Adsorption/desorption Filter is patentable internationally. Since that time Cenergy Solutions has filed for individual national patents in 74 strategic countries and will file in 17 more countries this year. 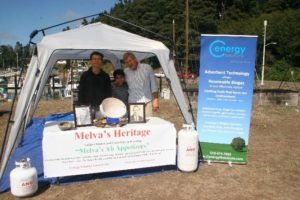 Natural and biogas is now being vented and flared around the world. Cenergy Solutions’ adsorbent natural and biogas storage and utilization tanks, cylinders and systems allows natural and biogas to be stored, transported and utilized efficiently and economically. Gary Fanger, CEO, CTO and Co-inventor at Cenergy Solutions said, “ This patent along with other International patents will allow Cenergy Solutions to bring cheap and renewable energy to individuals, communities and countries around the world. The future of natural and biogas usage will be done at low pressures, increasing the ability to safely and inexpensively capture this valuable resource that is now being wasted globally.” Cenergy Solutions has achieved numerous milestones with ANG storage and usage like running large and small vehicles on ANG, storing and transporting biogas at low pressures and replacing LPG cylinders with natural and biogas cylinders. Cenergy has successfully completed testing in California and India and will be starting additional natural and biogas storage and utilization systems in the US, Puerto Rico, India, Thailand, Kenya and other strategic countries over the next few months. The World Health Organization estimates that there are over 4.2 million deaths that come from pulmonary diseases related to smoke inhalation from burning biomass. Cenergy Solutions’ ANG Systems will give rural areas around the world the ability to not only store, transport and utilize their biogas it will give communities the ability to become energy independent by using their renewable biogas to cook, heat, run generators and operate farm and other vehicles of all sizes. Not only will Cenergy’s technology revolutionize the storage of natural and biogas on vehicles and in virtual pipelines it will help to deliver clean and safe energy to those that need it most worldwide. 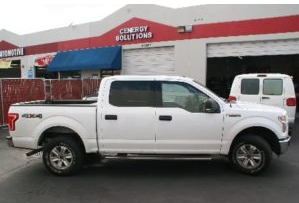 About Cenergy Solutions: Cenergy Solutions is a US company that is self-funded and has brought cutting-edge Adsorbed Natural Gas (ANG) storage to market for vehicles and other applications throughout the world. Cenergy Solutions, a world leader in adsorbent natural gas technology, teams up with APPL Industries Ltd, the largest plastic compounder in India to develop, manufacture and distribute Adsorbent Natural Gas products. 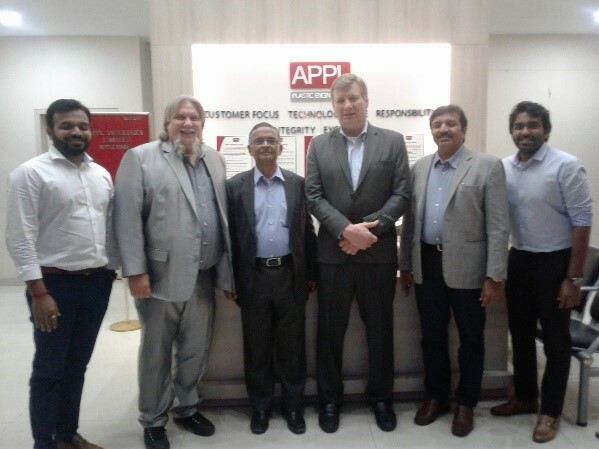 Fremont, California February 1, 2018 – Cenergy Solutions announced today that they have entered into a Joint Venture Agreement with APPL Industries Ltd, to form APPL- Cenergy Solutions, India to develop and distribute Adsorbed Natural and Biogas (ANG) products throughout India and Asia. Adsorbent Natural Gas or ANG has many game changing applications such as to capture and store natural and biogas a renewable energy, to be used to replace wood/coal burning, LPG usage, fuel natural gas vehicles to replace gasoline and diesel, powered vehicles, and store and distribute natural and biogas coming from stranded oil wells and biogas plants. The future of natural and biogas capture and storage will be with ANG which will store these gases at low pressures (200 to 900 psi) instead of high pressure (3,000 to 5,000 psi), substantially reducing energy costs. ANG can significantly reduce the use of wood, coal, gasoline, diesel and propane usage throughout the world and help replace it with a renewable energy. The technology to use adsorbents has been in development for the last 25 years but Cenergy Solutions has made some significant technological advancements over the last four years to allow them to bring their proprietary ANG technology to market. APPL Industries has 6 manufacturing plants in India which will provide a reliable and cost-effective way to manufacture and distribute ANG products in Asia. “This partnership will allow Cenergy Solutions to focus on improving ANG technology while APPL – Cenergy Solutions, India will focus on manufacturing and distributing ANG equipment in Asian countries.”, says Gary Fanger the COO/CTO of Cenergy Solutions. About APPL Industries Limited: APPL Industries, Limited is a Polymer compounding business in India, providing high class Engineered Thermo Plastic Compounds for Automotive, Appliances, etc. Presently one of the leading compounders in India having largest installed capacity of 125,000 MPT PA. APPL has been providing end-to-end material solutions like Pre-colored compounds based on Poly Olefins and Engineering Plastics. APPL innovative approach to compounding have led to a range of Customized compounds using MINERALS, GLASS FIBER / BEADS, WOOD FLOUR, FLAME RETARDANTS ETC. About Cenergy Solutions: Cenergy Solutions has brought cutting-edge natural gas equipment and Adsorbed Natural Gas (ANG) storage to market for vehicles and other applications throughout the world. 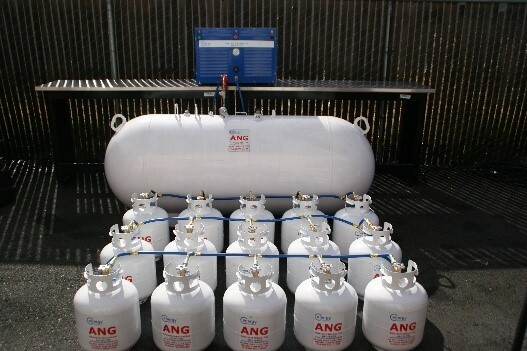 Cenergy Solutions’ proprietary ANG technology helps make natural gas and biogas, a renewable energy, economically available for individuals, communities, power/manufacturing plants, vehicles, wellhead storage and virtual pipelines to facilitate cleaner air and improved economy and energy independence. Cenergy Solutions’ patent pending ANG technology will change the way energy is stored, delivered and used throughout the world.